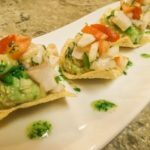 Tilapia Ceviche with Guacamole and Tortilla Chips | Mexican Appetizers and More! This Tilapia Ceviche with Guacamole and Tortilla Chips is a superb Mexican appetizer. Creamy guacamole, succulent tilapia ceviche and red pimientos on top of a tortilla chip. Absolutely delicious! So, I go out to this pretty famous restaurant chain for lunch the other day and ordered this appetizer that sounded quite delicious….well needless to say it was! I went on to devour my 5 pieces of ecstasy rather quickly. This is what sometimes happens to me, it’s not always taking traditional Mexican dishes or appetizers and re-creating them, or making them to my own liking, or even, creating my own Mexican dish, but instead being inspired through someone else’s authentic dishes and throwing a Mexican twist on them. This is what happened here! Hence, Tilapia Ceviche with Guacamole and Tortilla Chips was born! The appetizer I had, was more on the Asian side, with Ahi Tuna and mashed avocado but needless to say I was inspired! So what does it include that makes it mexicanish?? A yummy cilantro vinaigrette sauce, fresh tilapia ceviche, guacamole and a tortilla chip! Let me roll with this! 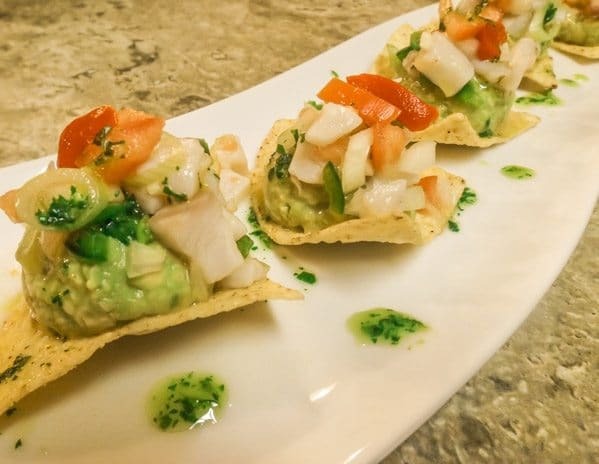 That being said, the true star of this appetizer is the tilapia ceviche, topped with the cilantro vinaigrette sauce. The combination of fresh tilapia with the cilantro vinaigrette sauce is truly a winner. If you are a lover of Mexican dishes as I am, then, this tiny scrumptious appetizer will make you very happy. PSsssst….one last thing, if you’re like me and don’t have accessibility to fresh seafood around the corner (my local fish market is a 50 minute drive), you may want to try out The Crab Place. They are awesome and there prices are fair to the market. You can order live clams, oysters, crabs, crayfish and lobsters delivered right to your door. 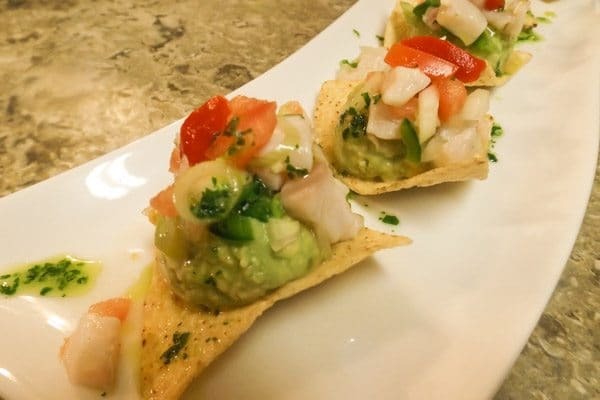 This Tilapia Ceviche with Guacamole and Tortilla Chips is a superb Mexican Appetizer.Creamy,flavorful guacamole, succulent ceviche over a chip.OMG YUMMY! Cut tilapia into small cubes and set aside in a plastic bowl. Cut all limes reserving half of a lime for the guacamole. 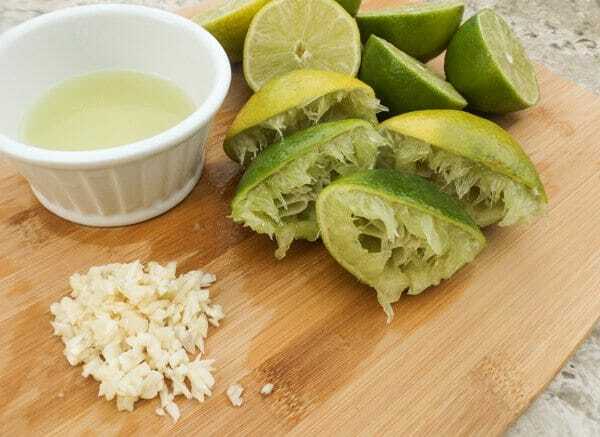 Squeeze and juice all other limes. Pour lime juice over tilapia, stir together and refrigerate. 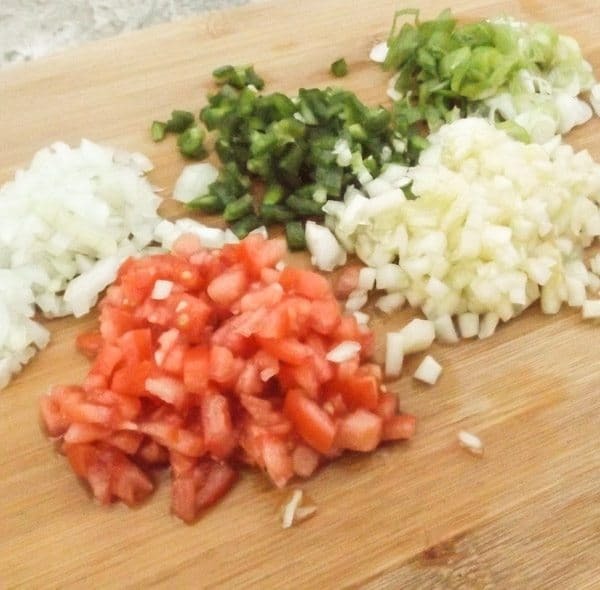 While tilapia is marinating in the lime juice, cut the tomatoes, cucumber, onion, jalapeños, scallions, cilantro and garlic. Add and mix all to tilapia with salt to taste. Refrigerate again for another hour until tilapia is cooked and flavors are well blended. Cut avocados lengthwise to expose pit. With a knife, gently tap pit and twist to remove it. Remove avocado flesh with a spoon and mash with a fork. Add the reserved lime juice to avocado to prevent discoloring. Add salt to taste and stir. In a blender or chopper, combine olive oil and cilantro. Pulse for a few seconds until blended. Place tortilla chip on a platter and with a cookie dough scooper or spoon, scoop guacamole on chip. Top with ceviche on top of guacamole and one or two pimientos. Sprinkle cilantro vinaigrette over ceviche, guacamole and chip. Enjoy! 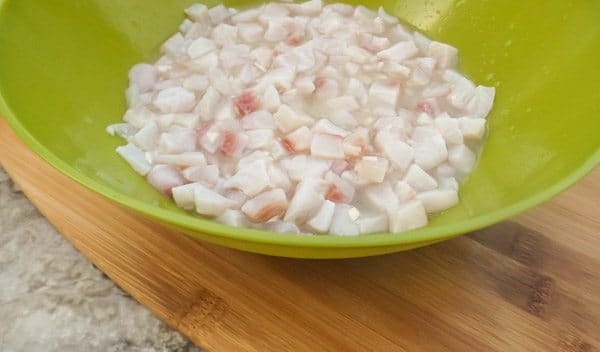 Chop tilapia into small cubes. Finely chop jalapeños, onion, tomatoes and cucumber. Slice scallions. Add all vegetables to tilapia mixture and allow to cook and marinate in refrigerator. Cut avocados lengthwise with a knife to expose pit. With a knife, gently whack the pit enough to be able to twist it off. With a spoon scoop out avocado flesh and mash with a fork. Sprinkle some lime juice so avocado does not discolor. (Here’s that simple little trick I was talking about!) Mix together and add some salt and pepper to taste. To assemble: Place tortilla chip on platter. Using a cookie dough scooper, scoop guacamole on top of chip. Top with Tilapia Ceviche and one or two, red pimiento. Finally, sprinkle Cilantro Vinaigrette sauce over your appetizer. Disclaimer: This post contains an affiliate link and I will earn a small commission if you purchase through this link at no extra charge to you. Thank you for your support. When will you be making Tilapia Ceviche with Guacamole and Tortilla Chips? Thank you Sidney! Did you try this appetizer? So yummy!